Outline: From Luke and John. 24 sections. It has a picture book to go along with the recording. Friends, I want to tell you about Jesus the Lord, and the wonderful things He did many years ago. Listen carefully to the recording while you look at the pictures in the Pink book. Look at the next picture when you hear the signal. The Gospel of John begins with these words, "In the beginning was the Word and the Word was with God and the Word was God." Later in the same chapter (v14) we read, "The Word became flesh and lived for awhile among us...". This means that the "Word" is a person. From further verses in John's Gospel we learn that the "Word" is the Lord Jesus Christ. This is how the Lord Jesus Christ came to live on earth. A young woman named Mary lived in a small town in Israel called Nazareth. Mary was one of Abraham's descendants. Mary was not married. She was a virgin who was engaged to marry a man named Joseph. One day God sent the angel Gabriel from heaven with a message for Mary. When Mary saw the angel she was afraid. The angel said, "Don't be afraid Mary, soon you are going to have a baby. God's Spirit (Holy Spirit) will make you pregnant and later you will have a baby boy. You will call Him Jesus because He will save people from their sin." Later the angel spoke to Joseph in a dream and said, "Joseph, don't be afraid to take Mary as your wife. The child she will bear is not from another man. Her child will be called the Son of God." Mary and Joseph were poor people. 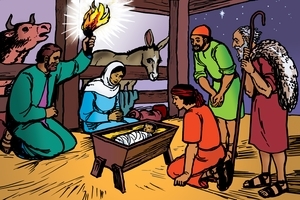 When Mary gave birth to Jesus the only place in which they could stay was a cattle-shed. Mary wrapped her baby boy in cloths and put Him in a manger (box used for the cattle's food). That same night, out in the fields near Bethlehem, some shepherds were looking after their sheep. An angel told them that the Saviour of the world had been born. Straight away the shepherds went and found the baby in the manger, just as the angel had said. Jesus grew up among the Israelite people. The words He said and the things He did showed people clearly what God is like. Jesus also showed us how the person who pleases God must live. Jesus made it possible for people to come to God, and be made right with Him. When Jesus was 30 years old He began to travel around Israel teaching the people about God. He did many amazing things that showed people that He was the Promised One (from God) for whom Israel had been waiting for a long time. Some men believed that what Jesus was teaching was true. They became close friends of Jesus and stayed with Him all the time so that He could teach them. They were called Jesus' disciples. Mary knew that Jesus was able to perform a miracle so she said to the servants, "Do whatever He tells you." 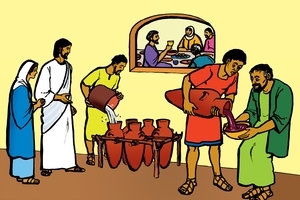 There were six large water jars there, where the people washed their hands as part of their preparation for worship. Jesus said, "Fill the jars with water." Then He said, "Now draw some out and take it to the master of the feast." The water had turned into wine. When the master of the feast tasted it he was surprised that the good wine had been kept until the last. By turning the water into wine Jesus showed that He really was from God. No man can turn water into wine. Only God can do that. The disciples saw what Jesus did and they began to understand that Jesus was the Lord (the promised one from God or the Son of God). Nicodemus was one of Israel's religious leaders. One night he went to see Jesus because he wanted to learn more about God. Jesus knew that Nicodemus did not fully understand God's Word. He said to Nicodemus, "Unless a person is born again he cannot go into God's kingdom." Nicodemus was surprised. He did not understand this so he asked Jesus, "How can an old man be born again? Can his mother bear him again?" Jesus said to Nicodemus, "God's Spirit must make a new life inside a person. Then that person becomes one of God's children. He enters the Kingdom of God." We must think carefully about what Jesus said. When we receive Jesus as our Saviour, God's Spirit makes a new life inside us. This means we are born again. We become new people and we belong to a new family - God's family. A person cannot be born again into God's kingdom because of the good works he does. It is God's Holy Spirit that gives this new life. This new life God gives us is called eternal life. It never finishes, it lasts forever. It is called eternal life. God's Spirit is in us forever. He never leaves us. Jesus walked through the land of Israel, teaching the people about God. One day He returned to the village of Cana and stayed there for awhile. In another village called Capernaum lived a man who had an important position as an official of the king. He was unhappy because his son was very sick, and it seemed as if the boy was going to die. When the man heard that Jesus was at Cana, he made the long journey (40 kms) to see Jesus. He asked Jesus to come with him to Capernaum and heal his son. Jesus said to the man, "Won't you believe unless you see signs and wonders." The man was very anxious about his son and kept asking Jesus - "Please come with me before my child dies." Jesus saw that the man really believed He could make his son well. Then Jesus said to him, "You can go now. Your son will live." The man believed what Jesus said, and with great joy went home to Capernaum. 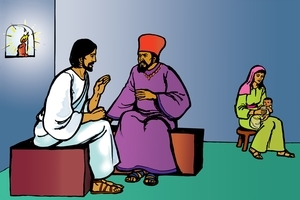 The next day, while he was still on the way home, his servants came to meet him and told him the good news that his son was well. The man asked them when his son began to get better. They said that the boy's fever had left him the day before, at 1 o'clock in the afternoon. The man knew that was the same time that Jesus had said to him, "You can go now, your son will live." Jesus had healed the boy even though He was a long way away from him. The man was very happy to come home and find his son well. He told his family and all his servants everything that had happened. Then they all believed that Jesus was the one God had promised to send to help all people. Jesus showed His great power by healing the dying boy, even though He was a long way away. This was another miracle which showed people that Jesus was the Lord (Son of God). 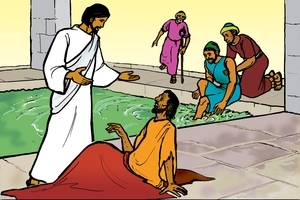 In the city of Jerusalem there was a pool of water where sick people gathered. It had five porches built around it. Sometimes there would be a movement in the water and the people thought that if they bathed in the water then, their sickness would be cured. One day Jesus went to the pool. He spoke to a man who had been sick for 38 years. "Do you want to get well?" He asked. The man said, "Yes, but I can't walk, and I don't have anyone to help me to get into the water." Then Jesus said to the man, "Get up, pick up your sleeping mat and walk!" Immediately the man was healed of his sickness. He got up, rolled up his sleeping mat and walked away. He was very happy. Jesus healed the man on the day the Jews call the Sabbath. It is the day when the Jews stop work and worship God according to God's command to keep one day a week holy. Some Jews were very angry that Jesus had healed this man on the Sabbath. They thought that Jesus had broken God's law by doing some kind of work. But Jesus knew that making the man well on the Sabbath was not the kind of work that broke God's law about the Sabbath. Jesus knew that making the man well on the Sabbath would please His Father God very much. Jesus showed by His great power over sickness that He is the Lord (God's Son). But many of the Jews were angry because they thought Jesus was not keeping God's law when He healed the man on the Sabbath. Jesus wants us to be kind and help people at all times. Jesus continued to teach and to heal sick people. As a result, many people followed Him wherever He went. One day, Jesus wanted to be alone with His disciples, to teach them. So Jesus and His disciples got into a boat and went to the other side of the big lake of Galilee. There they were a long way from any villages. But the people found out where they were going and a large crowd walked around the lake to where they were. There were more than 5,000 people. Jesus welcomed the people because He knew they needed His help. He taught them about God and He healed the people who were sick. Late in the afternoon the disciples said to Jesus, "The people are hungry and it is late in the day. Send the people away now so they can go and get food, for we are a long way from any villages here." Jesus said to His disciples, "Why don't you give them something to eat? Where can we buy enough food to feed them all?" Jesus knew what He was going to do, but He was testing His disciples to see if they really believed in His power as the Lord (Son of God). 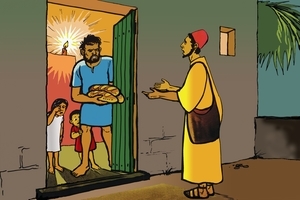 The disciples said, "It would take a huge amount of money (hundreds of dollars) to buy enough bread for these people - even if you only gave each person a small amount." Jesus said, "Well, what have you got?" One of the disciples, Andrew, said, "There is a young boy here who has five small loaves of bread and two fish which he will share with us - but that is so little among so many people." Jesus told the disciples to make all the people sit down in groups. He stood up before them all and gave thanks to God for the bread and fish. Then He broke the food into pieces and gave it to the disciples. 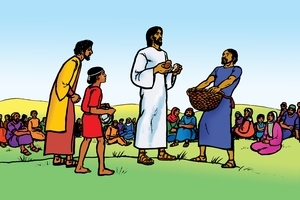 The disciples took the food and distributed it among all the people until they had all that they wanted. The pieces multiplied into enough for everyone. Afterwards they collected twelve baskets full of food that was left over. Everyone was amazed at this great work that Jesus did. They said, "Jesus must be the person God said He would send to help all people. Let us make Him our king!" However Jesus would not let them do this. Jesus told the people that they should not only work for things like food, that only last for this life. They must work for spiritual food that lasts forever. Jesus said, "I am the bread of life. He who comes to Me will never be hungry, and he who believes in Me will never be thirsty." As we meditate on God's Word and pray, we receive the spiritual food/bread that makes us grow more like Jesus. After the large crowd of people had finished eating the bread and fish, Jesus sent them all away to their homes. He told His disciples to get in their boat and row across the lake to the other side. Then Jesus went up the hillside alone to pray to His Father, God. Later that night the disciples were still out on the lake, rowing hard against a very strong wind and rough waves. Jesus saw that they were in trouble, and He came to them, walking on top of the water. The disciples saw Him coming and they were terrified. They cried out in fear for they thought it must be a spirit. But Jesus spoke to them and said, "It is I. Don't be afraid." 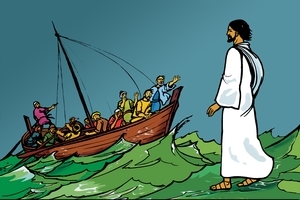 When the disciples realised who it was, they were very glad to welcome Jesus into the boat. Then the storm ceased, the water became calm, and straight away they arrived at the shore where they wanted to go. Jesus' disciples were amazed. Only God is able to walk on the water and has the power to calm a storm in an instant. Jesus must be God. It is the same for us too. There are many things that cause us distress and trouble, many things that make us afraid like the disciples were in the boat. But Jesus knows everything that happens to us. We can call out to Him to help us, and the power of Jesus will overcome our fears. One day, Jesus was walking with His disciples and they saw a man sitting by the road, begging for food and money. The man had been blind ever since he was born. The disciples said to Jesus, "Is this man blind because of some wrong he has done, or because of some wrong his parents did?" 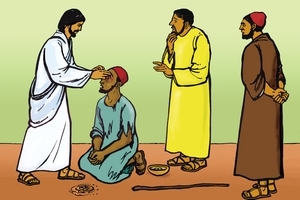 The disciples thought that the blindness was a punishment from God. But Jesus told them that they were wrong to think that. The man was born blind so that people could see God's great power at work in him. 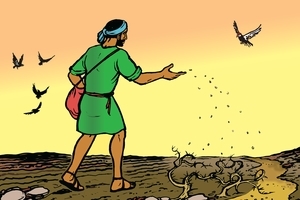 Then Jesus spat on the ground and made some mud. He put the mud on the blind man's eyes. Jesus told him to go and wash the mud off in the pool of Siloam. The man went and did this and then he was able to see. He was very happy. His family and friends could hardly believe it was true. Some people even thought it might be a different man. Some of the Jewish leaders were unhappy when they heard what had happened to the blind man, because Jesus had done this great work on a Sabbath day. They asked the man many questions, because they did not believe that Jesus could do such a miracle. But the man knew that only a man who came from God could make a blind man see. Jesus did this great miracle to show people that He is the Light of the World. The blind man had been in darkness all his life but Jesus made him see again and that brought light into his life. We are like the man born blind. We walk in (spiritual) darkness and do not know the light of God in our lives. But Jesus is the one who can bring that light to us. Jesus said, "I am the Light of the World. He (a person) who follows me will not walk in darkness but will have the light of life." Many people are like the Jewish leaders. They think that their ways are right. But they really do not know God and they do not know how to find Him. They are walking in darkness. Only when we come to Jesus will we be able to see the way to God. Mary and Martha and their brother Lazarus were close friends of Jesus. They knew that Jesus loved them. One day Lazarus became very sick. Mary and Martha were very worried. They thought Lazarus would die. So they sent a message to Jesus, who was staying in a place two days' walk away. When Jesus heard that Lazarus was sick He said to His disciples, "The final result of Lazarus's sickness will not be death. Instead, God the Father will be glorified (honoured) and much honour will come to Me (the Son of God)." Jesus loved Lazarus and his sisters, but He did not go to them straight away. He waited two more days. Then Jesus said to His disciples, "Lazarus is dead. I am glad that I was not there when he died, because this will help you to believe that I am the Lord." Jesus and His disciples went to Bethany where Mary and Martha lived. When they arrived there, they found that Lazarus had been in the grave for four days. Mary and Martha were very sad that their brother was dead. They were also disappointed that Jesus had not come to heal Lazarus before he died. But Jesus said to them, "Your brother will rise again. I am the One who raises dead people and gives them life again. Anyone who believes in Me (loves Me and obeys My words) has eternal life Even if he dies, I will raise him up again and he will live forever with Me." Then Jesus said to them. "Where is Lazarus buried?" They took Jesus to Lazarus's grave. 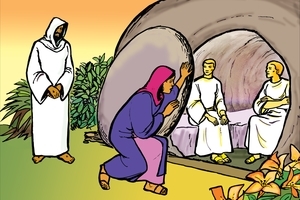 They had put his body in a tomb (cave) and covered the entrance with a very large stone. Jesus told them to take the stone away from the entrance to the tomb. Martha objected to this. She said, "He has been dead for four days - there will be a very bad smell." But Jesus told her not to worry about that. If she believed in Him (Jesus) she would see God do something very wonderful. So the people rolled the stone away from the entrance of the tomb. Jesus looked up to the sky and said, "Father, thank you for hearing my prayer." 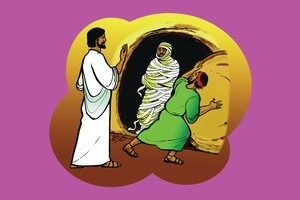 Then Jesus shouted, "Lazarus, come out!" Lazarus came out of the grave, but he was still bound up with grave clothes. Jesus said, "Take off the grave clothes and let him go." The people did this and Lazarus and his sisters, and all their friends were very happy. All the people who saw this were amazed at what Jesus did and they praised God for what had happened. Now, many of them believed that Jesus was the Lord (the Son of God). But some of the Jewish leaders did not believe. They thought that the only way to stop Jesus becoming their king was to kill Him. So they tried to work out a plan to do this. When Jesus raised Lazarus from the grave He showed His great power over death and Satan. If we love Jesus and obey His Word, then Jesus lives in us and we have His power. We do not need to be afraid of death, or of anything that Satan would do to us. Jesus did many wonderful things. He healed sick people, cast out evil spirits and gave food to hungry people. Jesus did many great miracles (works), and showed people that He was the Lord (God's Son). Therefore many people followed Him and wanted Him to be their king. But the Jewish leaders were jealous that so many people were following Jesus. They did not like the things Jesus taught and they did not believe that He was God's Son. They wanted to kill Jesus (and get Him out of the way). Then Judas, one of Jesus' disciples, came to the Jewish leaders secretly. He told them how they could arrest Jesus in a quiet place when only a few of His followers would be with Him. The Jewish leaders paid Judas for helping them in this way. Later they arrested Jesus and took Him to court. The Roman governor, Pilate, could not find Jesus guilty of any wrong. But the Jewish leaders and some of the people shouted strongly for Jesus to be put to death (crucified). 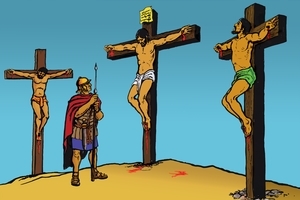 Finally, Pilate said they could kill Jesus and the soldiers took Him away. The soldiers nailed Jesus' hands and feet to a wooden cross. They stood the cross up and Jesus hung there in great pain for many hours. Two other men were crucified at the same time as Jesus. They were robbers who were dying as punishment for their sins. Jesus had done nothing wrong. He died to take the punishment for the sin of all people. Jesus gave Himself as a sacrifice to God. His blood was shed so that God could forgive our sin. Jesus did this so that everyone who believes that Jesus died in their place can be reconciled to God. Some of Jesus' friends came and took His body from the cross. They put His body in a cave (tomb). It was a new tomb that people had just made and no dead body had been put there before. They covered the entrance to the tomb with a huge stone. Jesus died on a Friday. Two days passed and on the third day Jesus rose from the dead. God made a big earthquake, and an angel came to Jesus' grave and rolled away the big stone. The day that Jesus rose from the dead, we call Sunday. Early on Sunday morning, some women came to the tomb. 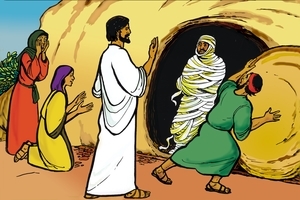 They were very surprised to see that the tomb was open and Jesus' body was not there. One of the women was Mary Magdalene. Before, Jesus had cast out seven evil spirits from her. Now she was a follower of Jesus. The women saw two angels in the tomb who told them that Jesus had risen from the dead. Mary ran quickly and found some of Jesus' disciples and told them what had happened. They ran to the tomb and were very surprised to see that Jesus' body was gone. It was difficult for them to believe that Jesus had risen from the dead. All the others went away, but Mary stayed at the tomb. She was crying because she did not know what had happened to Jesus' body. Suddenly she saw two angels in the tomb. They said to Mary, "Why are you crying?" She said, "Because I don't know where they have put Jesus' body." At that moment Jesus walked up behind Mary and said, "Why are you crying?" Mary thought he must have been the gardener, so she asked Him if He had taken Jesus' body away. Jesus said to her, "Mary." When she heard Him say her name, Mary realised straight away that it was Jesus, and that He had truly risen from the dead. Mary was the first person to see Jesus after He rose from the grave and she went quickly and told all the disciples. Jesus knew Mary's name, and He knows each one of us. He cares for us and wants to save us. When Jesus came alive again He showed everyone that He is God. He is stronger than death or the power of sin. He has broken the power of Satan. Therefore, if we love Jesus and obey His Word, Satan has no power to harm us. A little while after Jesus rose from the dead, He appeared to some of His disciples at the Sea of Galilee. This is what happened. Peter said to some of the disciples, "I am going fishing." Six other men went with Peter. They fished all night but caught nothing. Just as the sun was rising Jesus stood at the water's edge and called out to them, "Have you caught anything?" They replied, "Nothing." Jesus said, "Throw your net on the other side of the boat and you will catch some." The disciples did not know it was Jesus, but they did what He said and straight away their net was full of big fish. Then John said to Peter, "It is the Lord." Peter jumped out of the boat and swam to the shore where Jesus was. 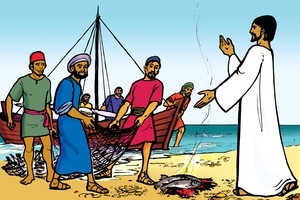 The other disciples brought the boat to shore, with the huge catch of fish. Jesus already had fish and bread cooked on a fire for them. They sat and talked and had their meal together. They were very happy to be with Jesus. Once again Jesus showed His great power as Lord (Son of God) and the disciples realised that nothing was too difficult for Jesus to do. Then Jesus spoke especially to Peter. 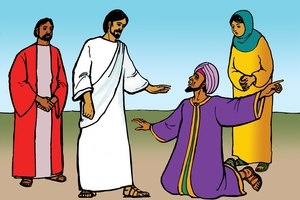 Before, when Jesus was arrested, Peter had denied that he even knew Jesus. Peter was very ashamed of that. Now Jesus showed that He had forgiven Peter. 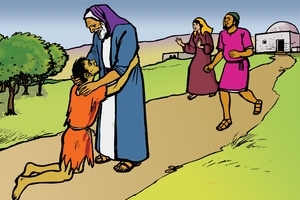 He told Peter to take care of the people who followed Jesus, and to teach them about Him. Jesus knows each one of us too. He knows when we make mistakes and do not do things very well. But He is ready to forgive us and help us. We know from these stories that Jesus is the Son of God. Only God can do the great things that Jesus did. Jesus calls us to follow Him today. Jesus said, "Go into all the world and preach the Gospel to every creature." God promised the Jewish people that He would send them a Saviour. For many years they waited for this person to come. They thought He would be a great military leader (like King David) who would help them defeat their enemies and establish Israel as a great nation. God sent the Lord Jesus to be the Saviour of Israel and the Saviour of all people. But Jesus was a very different person to the one the Israelite people thought He would be. These stories from the Gospel of Luke help us to understand what a great Saviour Jesus is. After Jesus rose from the dead He appeared to Mary Magdalene. She told the disciples that Jesus had risen, but they found it hard to believe. That same day two men were walking from Jerusalem to their village of Emmaus. They were talking about all the things that had happened recently in Jerusalem. Suddenly Jesus came alongside and started walking with them. God prevented the men from recognizing Jesus. Jesus asked them what they were talking about. They told Him about all the great things Jesus had done, and how He had been killed. Now they had heard that Jesus had risen from the dead and they didn't know what to think. Jesus told them they should believe what the Bible said. Then He spent a long time walking with them and teaching them what all the prophets had written about Himself (Jesus). The prophets had said that the Saviour would suffer and die and also rise again and receive much praise and honour. 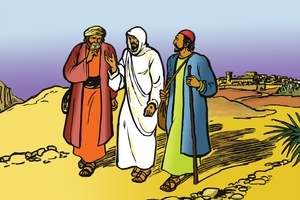 When they arrived at Emmaus, the two men invited Jesus to stay for the night. As they were eating their meal together Jesus broke some bread and gave it to them, just like He had the last time He ate with His disciples. Then Jesus disappeared from their sight. God opened their eyes and they realised the man was Jesus. Jesus was alive. He had risen from the dead. They went and told Jesus' disciples. All the disciples were full of joy because they knew that Jesus is truly the Saviour God had promised to send to the world. Jesus told a story about a man who had two (adult) sons. One day the younger son said to his father, "Father, please give me now the share of the property that will come to me as my inheritance." The father agreed and divided up his property between his two sons. Soon after, the younger son gathered all his belongings together and went to live in afar-off place. In that place he wasted all his money with reckless living. (He gambled, had drunken parties, and stayed with prostitutes.) He did this until all his money was finished. But then a famine came to that place and the man became very hungry. He realised he was a very poor man and he had no friends. The only work he could get was feeding pigs on a farm. 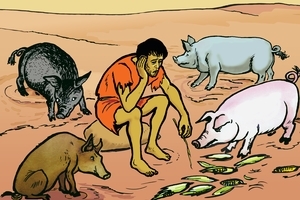 This was very shameful work for a Jewish man because pigs were a forbidden animal to them. No one cared for the man at all. He was so hungry he even wanted to eat the pigs' food. 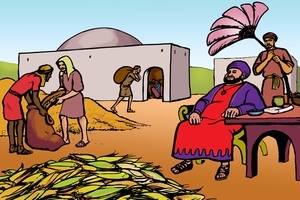 Then he thought, "On my father's property, even the poorest servants have plenty of food to eat. It will be better if I go back to my father. I will say to him, 'Father, I have sinned against God and against you. I am not fit to be called your son. Give me a job as one of your hired servants.' " The man decided to go back to his father's place. The younger son walked back to his father's house. His father was waiting for his son to come home. When he saw him coming he ran to meet him and embraced him. The father was very glad to have his son return home. The son said to his father, "Father, I have sinned against God and against you, and I am not fit to be called your son." But his father did not let him say another word. 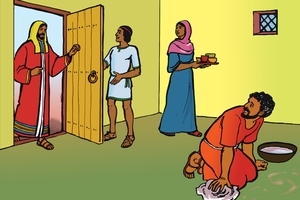 He told his servants to bring the best clothes and some shoes for his son, and a ring to put on his finger. He said, "Let us have a feast and celebrate. This son of mine was dead, but now he is alive. He was lost, but now he is found." Jesus told this story to help us understand what God is like. God is like the father of the two sons. We are separated from God because of sin. God is longing for us to come back to Him. When we are sorry for our sin and ask God to forgive us, we come back to God. God is happy to receive us. The Bible tells us the angels in heaven are happy too when a sinner repents. Jesus taught people that it is more important to prepare for life after death than to have a lot of earthly possessions. He told this story. A rich man had a farm which bore good crops, but his barns were not big enough to store all the grain. He thought, "I will pull down my barns and build bigger ones. Then I can store all my grain and all the other things I have. I am a lucky man. I have everything I need for many years. I can take life easy now. I will eat and drink and just enjoy myself." But God said to this man, "You are a fool. Tonight your life will finish, and all these things you have stored up will belong to someone else." This man was not interested in pleasing God, and he did not think about using his riches to help others. He only thought about pleasing himself. He did not believe that being rich had anything to do with God. But God knew the man's earthly riches were only temporary. In God's sight he was very poor. When his life finished his spirit would be separated from God forever, and he would be in a place of pain and torment. His riches would not be able to help him then. Jesus said to His disciples, "Do not be worried about the food you need to eat, or the clothes you need to wear. Your Father God knows that you need these things and you are more valuable to Him than anything else in the world." We know that God is the source of everything we have - health, wealth and wisdom. We can trust Him to supply all our needs. Jesus does not want His followers to be greedy. When we show the love of Jesus to other people and help those who are poor, we are blessed. We may not be rich on earth, but Jesus says we are storing up treasure in heaven. Jesus told this story about a rich man, and a poor man named Lazarus. The rich man had many servants and lived in a big house. 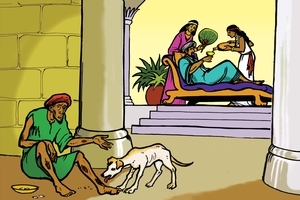 Lazarus lived on the street just outside the rich man's house. He was hungry and sick and the dogs came and licked his sores. The rich man did not think about Lazarus. He only thought about himself. Lazarus thought about God and tried to please Him. When Lazarus died the angels took him to a wonderful place in heaven where he was with Abraham, and he was very happy. The rich man died too, but he went to the place of terrible pain and suffering and fire. He could see Lazarus with Abraham. He called out and asked Abraham to send Lazarus to help him. However, Abraham explained that it was not possible to do that. People could not go from one place to the other even if they wanted to. The rich man then asked Abraham to send Lazarus to warn his five brothers about the terrible place of fire and suffering. But Abraham said that the rich man's brothers had God's Word to warn them about what happens after death. If they did not listen to God's Word they would not listen to someone who came back from the dead. Just because a person is rich does not mean that God is pleased with him. Whether a person is rich or poor, the most important thing is to please God and to show His love to all people. Jesus taught that after a person dies, he can't change what will happen to him. After we die, it is too late to think about listening to God's Word. Now is the time for us to listen to God's Word and obey it. Jesus' disciples could see that He spent a lot of time praying to His Father God, so they asked Jesus to teach them to pray. Jesus told them a story to teach them that they should always keep on praying to God and asking Him for the things they needed. Jesus said, "If someone you know, who is on a journey, arrived at your place late at night, you would invite him to stay, even if you didn't have enough food. Then you would quickly go to a friend's house and call out to him, 'Please lend me three loaves of bread. A friend has just arrived and I don't have enough food.' Your friend would call out from his bedroom and say, 'Don't bother me now! It's midnight! My family and I are in bed and the house is locked up ... I can't get up now and give you anything.' Yet, because you are not ashamed to keep on asking him, he will eventually get up and give you everything you need." Jesus continued, "It is the same when praying to God. Ask and keep on asking and you will receive. Look and keep on looking and you will find. Knock and keep on knocking and the door will be opened for you. You men who are fathers, if your boy asked for bread, will you give him a stone? If he asks for fish, will you give him a poisonous snake? Of course not! And if sinful people like yourselves know how to give good things to your children, God, your Father, knows even better how to give good things to you when you ask Him. He will give God's Holy Spirit to those who ask Him." These words of Jesus help us to understand more about praying to God. God always answers our prayers. Sometimes we have to keep on asking the same prayer for a long time. Sometimes it seems to take a long time before God answers our prayer. Wherever we are at any hour of the day we can pray to God and He will hear us. Jesus taught His disciples that when we pray to God, God looks at our hearts and not just the outward appearance that other people see. 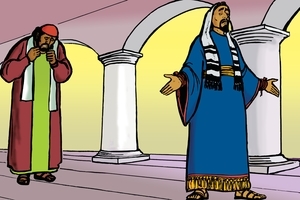 Jesus told this story about two men who went up to God's temple to pray. One man was a Jewish religious leader, the other man was a tax collector. The Jewish religious leader talked to God, but all he did was tell God about himself. He said that he was a good man who kept all God's laws and that he was a much better person than the tax collector. The tax collector was too ashamed of himself to lift his head up while he prayed to God. He bowed his head and beat his chest with his hands because he was so sorry for his sinfulness. He said, "God, have pity on me for I am a sinful man." Jesus said that God heard the prayer of the tax collector and He forgave him his sins. But He did not do that for the other man. The other man was proud and God is very displeased with proud people. So, when we pray to God, remember that God knows our hearts. If we are proud and selfish and do not care about others, God will not listen to us. But if we are humble before God and think about others more than we do ourselves, God hears our prayers. A huge crowd of people gathered to listen to Jesus' teaching. But Jesus knew that many of the people did not obey the things He taught. He wanted them to realise that it is very important to hear God's Word and obey it. So He told them this special story. A farmer went out to sow seed on his land. As he scattered the seed across the field some of it fell on the path at the edge of the field. 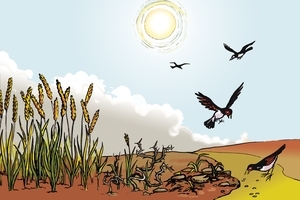 People came along and walked on that seed and the birds came and ate it. Some seed fell on rocky ground where the soil was very shallow. The seed began to grow, but soon withered and died because the sun was hot and there was not enough moisture. Other seed fell among thorns and the thorns grew up with the plants and choked them so that they did not produce any grain. Still other seed fell on good ground. The plants grew and bore grain one hundred times more than was sown. Jesus' disciples listened carefully to the story but they were not sure what the story really meant. They asked Jesus to explain it to them. Can you understand the story? Turn to the next picture and listen carefully. When Jesus was alone with His disciples, He explained to them the story about the farmer. Jesus often told stories that had a special spiritual meaning. The seed that the farmer sowed represents the Word of God. The seed that fell on the path represents people who hear God's Word but their hearts are hard and Satan comes and quickly takes the Word away so that they cannot believe it and be saved. The seed that fell on the rocky ground represents people who hear God's Word and for a little while accept it gladly. But when times of testing come and people begin to persecute them, they lose interest and stop following God's Word. The seed that fell among the thorns represents people who hear God's Word, but they let the worries and riches and pleasures of this life crowd in and become much more important than pleasing God. These people never produce anything really worthwhile in their service for God. But the seed that fell on good ground represents people who hear God's Word and obey it carefully all the time. Just like the many seeds on the head of a ripe plant, the lives of these people are full of many good works that please God and help other people. Think carefully about this story. How have you received the Word of God? Is your life full of good works that please God and help other people? Jesus wants us to love God and obey His Word and to make that the most important thing in our lives. One day as Jesus was teaching the people, a Jewish religious teacher asked Jesus a question. He said, "Teacher, what must I do to receive eternal life from God?" Jesus said, "What does God's Word say?" The man replied, "You must love God with all your heart, all your soul, all your strength, and all your mind. And you must love other people as you love yourself." "That's right," said Jesus. "If you do that you will receive eternal life from God." But the Jewish teacher said, "Who are the other people I should love?" A man was travelling from Jerusalem to Jericho when robbers attacked him. They took his clothes and money, beat him badly and left him to die on the road. Soon after, a Jewish priest came along, but when he saw the injured man he just walked by on the other side. In the same way, a Jewish temple-assistant (Levite) came along. He went and looked at the injured man, but he did not do anything to help him, he just kept on walking. Then along came a Samaritan man. Samaritans were foreigners to the Jews and usually they did not have anything to do with each other. But this Samaritan saw the man was badly hurt. He had pity on him and helped him. 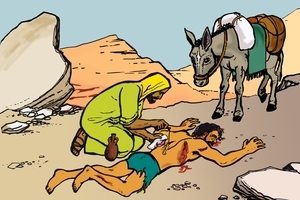 He cleaned the man's wounds, put medicine on them and bound them up. Then he put the man on his own donkey and took him to a nearbv hotel. He looked after the man through the night and next day gave some money to the hotel-keeper and told him to take care of him." Jesus said to the Jewish teacher, "Now, which of these three people showed love to the man who was injured?" The Jewish teacher replied, "The one who showed pity and took care of him." That's right," said Jesus, "Now you go and do the same." The people in this picture are the servants of a rich man. The man standing at the door is their master. He has been away on a long journey. He is happy to find his servants are busy doing their work even though he has been away from home for a long time. In the Bible there are several lessons Jesus gave about faithful servants. Jesus said that when the master of a big house returns from a journey and finds his servants faithful, he will be so pleased that he will prepare a special feast for them. The master will even serve his servants. The master will want a report of how the servants have done their work and will give rewards to those who are faithful, but will punish those who are lazy. People who love and obey the Lord Jesus are His servants. Jesus wants us to do our work every day just as if we are doing it for Him. We would be ashamed for Jesus to see us doing our work carelessly. Jesus wants us to be faithful in telling others about Him. Everybody needs to know Jesus so that their sin can be forgiven. Jesus promises to be with us all the time. Jesus is preparing a special place in heaven for all people who are trusting in His salvation. We do not know whether we will have to wait until we die to meet the Lord Jesus or whether He will come back to earth while we are still living here. The important thing is that we live our lives as servants who are always ready for their Master to come home. Zacchaeus was a wealthy tax collector who lived in Jericho. He collected tax money from the Jewish people for the Roman government. The Jewish people did not like the tax collectors because they usually took more tax money than they should and then kept money for themselves. That way they became rich. The Jewish people felt that tax collectors were friends of the Roman government - who were the enemies of the Jewish people. Zacchaeus was not like by the people of Jericho. One day, Jesus was passing through the town of Jericho. A large crowd of people were there to see Him and to listen to His message. Zacchaeus wanted to see Jesus. There was a large crowd around Jesus and Zacchaeus, who was only a short man, could not see Him. He ran ahead to a place he knew Jesus would pass and climbed up into a tree. When Jesus came along with the crowd, Zacchaeus could see Him very well. 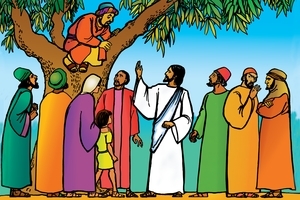 But he was very surprised when Jesus stopped right under the tree and called out to him, "Zacchaeus, Come down now. I must come and stay at your house today." This made Zacchaeus extremely happy. He climbed down from the tree and took Jesus to his house. He wanted to be one of Jesus' followers, but he thought that God would not accept a bad person like himself. Now he knew that God loved him and that Jesus wanted to be his friend. But the people were very displeased. They said, "Zacchaeus is a bad man. It is not right for Jesus to be a friend to him." Zacchaeus said to Jesus, "I will give half of my possessions to the poor people. And if I have cheated anyone (by taking too much tax) I will give them back four times as much as I took." Jesus said, "This man's life is now right with God and he has become one of God's people. It is people just like this that I came to help - people who live bad lives and who are not right with God. I came to find them and bring them back to God." Jesus is a Wonderful Saviour. He loves all people, even those who are very bad and He wants to save them all. Jesus can change people too, just like Zacchaeus. He can change people's hearts and make them stop doing bad things and help them to please God in all they do. See different versions of this script in Afrikaans, Buhutu, Chinese Simplified, English: South African, French, Herero, Indonesian, Kimwani: Ibo, Lomwe: Mozambique, Malagasy Merina, Ngonde, Northern Sotho, Obo Manobo, Pijin: Solomon Islands, Portuguese: Brazil, Portuguese: Mozambique, Russian, Sena: Mozambique, Shimaore, Shona, Spanish, Swahili: Tanzania, Takwane, Tok Pisin: PNG, Tonga: Malawi, Tsonga, Umbundu, Urdu, Venda, Xhosa, Xirima, Yao: Malawi, Zulu.